Anthony Quesada (B.S. ’16) is something of a renaissance man. In his four years at St. Mary’s University, he was a tutor, dancer, singer and, according to the numbers, an outstanding medical scholar. Quesada scored in the 100th percentile on the Medical College Admission Test (MCAT), which means he can attend just about any medical school in the country. He will start at Baylor School of Medicine in the fall. Tim Raabe, Ph.D., Professor of Biological Sciences, said Quesada’s MCAT score is the highest he had seen since he started teaching at St. Mary’s in 1997. Quesada’s performance also turned heads at Kaplan, a corporation that makes its business helping students perform well on standardized tests, such as the MCAT and GRE. Kaplan was so impressed that they offered Quesada a part-time job as a test instructor. In addition, Quesada tutored through the Learning Assistance Center at St. Mary’s. He devised his own study techniques to help others absorb information and improve their test scores inside and outside the classroom. As St. Mary’s very own MCAT test prepper, he even wrote a paper about his methods. 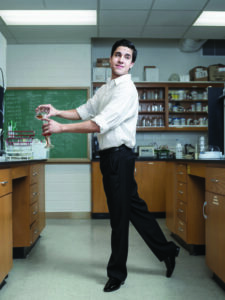 Quesada came to St. Mary’s as a San Antonio Livestock Exposition scholar, a Facilitated Access to Scientific Training scholar and an Honors Program member. He worked with St. Mary’s professors researching parasites on fruit flies and mosquitoes to better understand disease control. All this was plenty to keep the recent graduate busy for four years at St. Mary’s. But wait, there’s more. When he wasn’t in the lab, Quesada could be seen — or heard — singing. He joined the St. Mary’s chapel choir his freshman year and concert choir the next. As a sophomore, Quesada founded the StMU Opera Guild, an a capella student organization. He also competed with a ballroom dancing group.